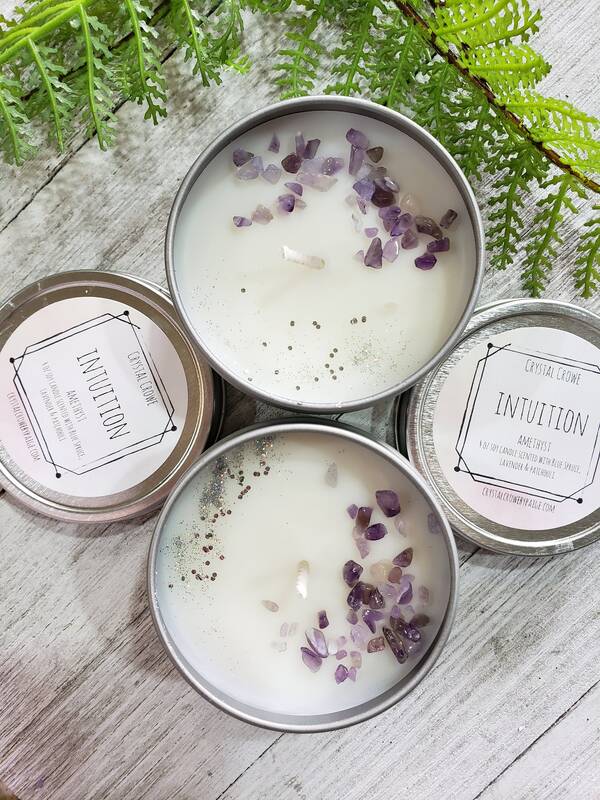 INTUITION Amethyst Crystal Candle , 4 oz, 100% Soy, Eco Glitter Candle. Amethyst is known to provide restful sleep and relaxation. Good stone for sobriety, and to help keep you safe from psychic attacks. 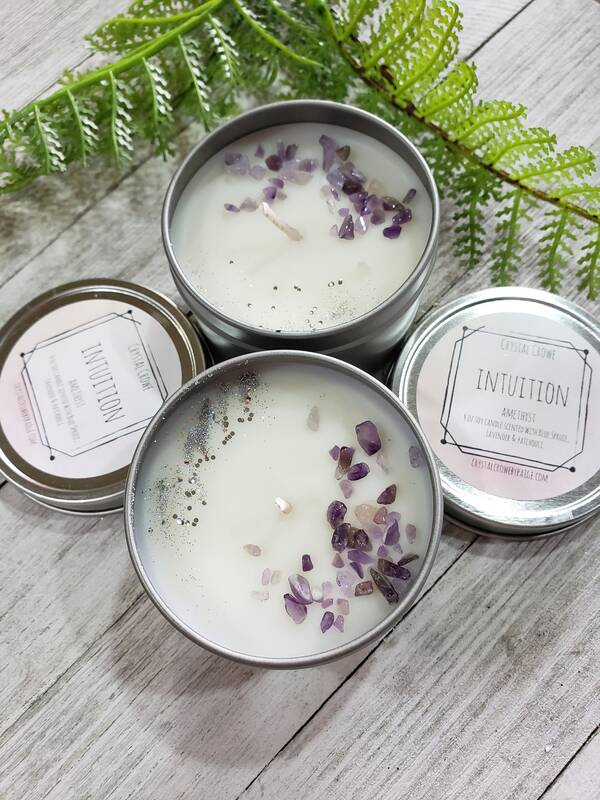 Boosts intuition, clairvoyant abilities and helps you tap into your higher self so that you can better connect with the Divine Source. Helps one become more consciously awake by increasing spiritual awareness. Relieves stress by encouraging a peaceful mindset. Helps one to maintain focus and mindfulness during meditation. 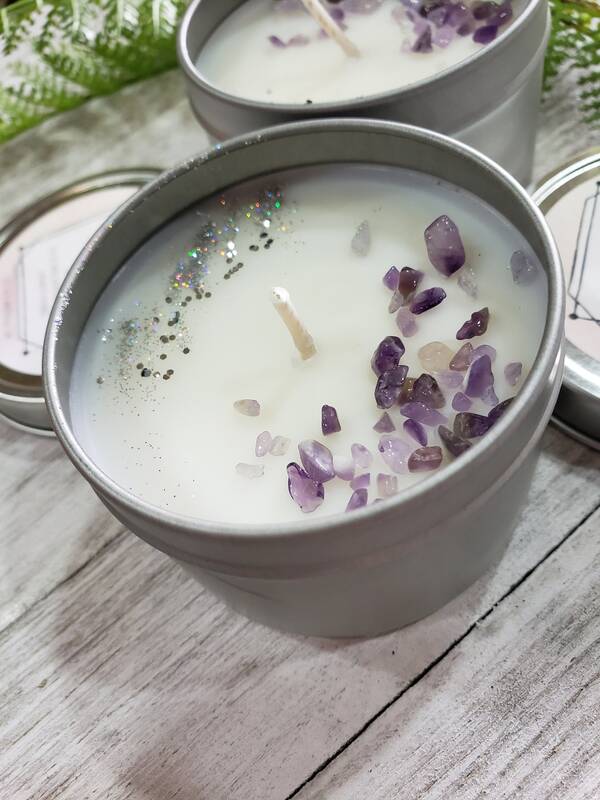 This candle contains 100% soy wax, eco wick, eco glitter and an organic Sage scent that makes you feel like you're transported to a magical winter forest! This size candle is great for a small room. fts, children, animals, or near any drapes or flammable objects. Do not burn for longer than 4 hours at a time. Candle is completely finished when it is melted down to about a half inch from the bottom. Then you can safely and carefully retrieve your crystals, just lightly rub clean of any wax residue. You can put the tiny stones in a small pouch and carry in your purse, pocket or car. Make sure you let the wax reach a full melt pool before blowing out, or your candle will tunnel. Before relighting you MUST trim the wick back down to a 1/4 inch. Make sure the black substance on the wick is trimmed down and not left in the candle. 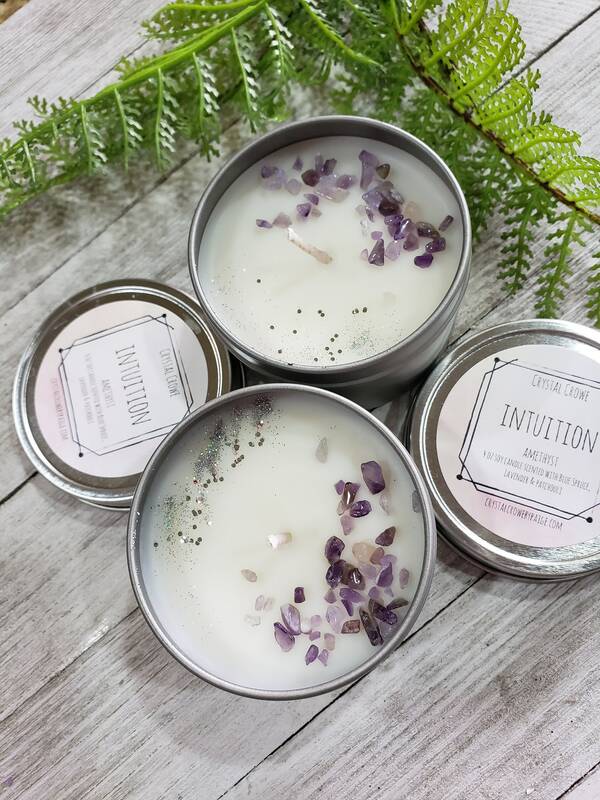 I highly suggest that every time your candle is lit you take some time and connect with it and meditate or infuse your positive intentions with the candle.